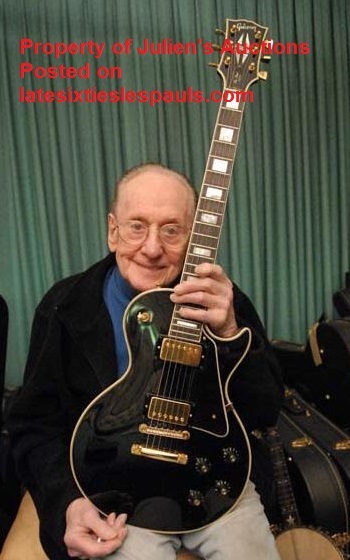 "Gibson Les Paul Custom - Black with Gold Hardware, Hi-Im-Pickups, Hi Frets, Guitar is Brand New, Cleaned, Polished, & Restrung with Sissy Strings." 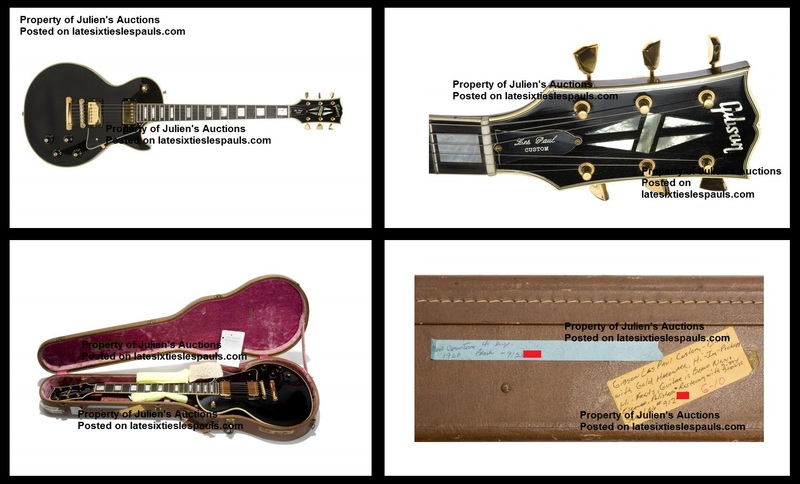 Julien's Auction Description: "Serial number 912xxx - Early 1970s Gibson Les Paul Custom, black with a three piece neck and two piece body, in non-original case. Together with handwritten notes in case on two pieces of paper reading in part, "frets popping up" dated 10-8-98." "Restrung With Sissy Strings" -- Les, you crack me up! 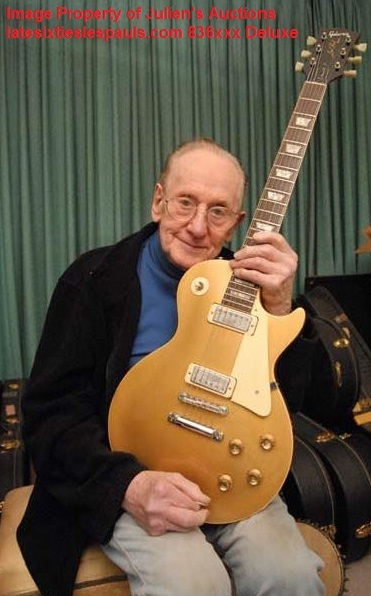 "Gibson Les Paul Deluxe - Gold with Epiphone HI-Im-Pickups, Hi-Frets, Guitar is Brand New, Completely Stock, Cleaned, & Polished...Very Good Action." Julien's Auction Description: "Serial number 8360xx - 1969 Les Paul goldtop Deluxe in original case. 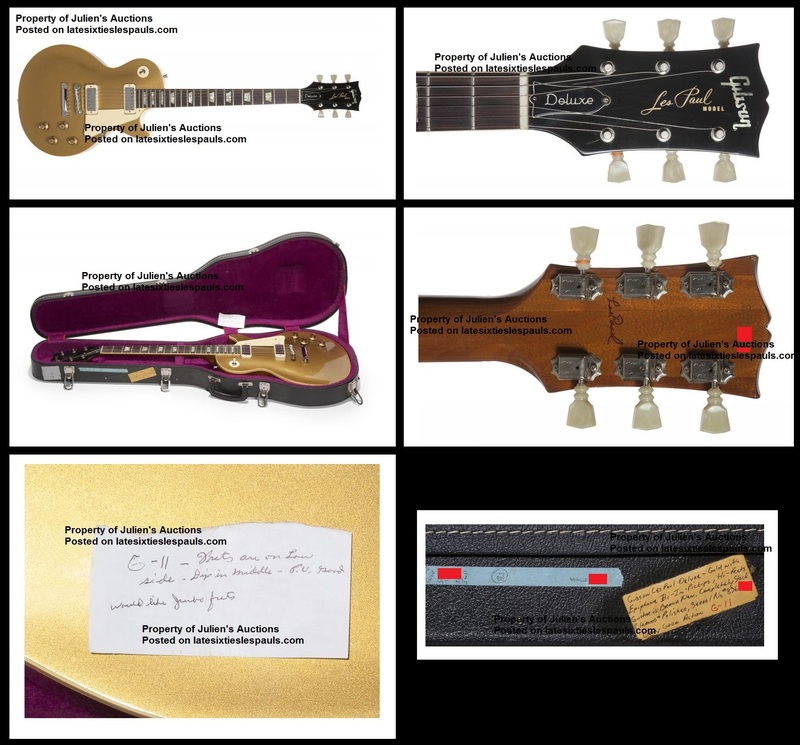 Back of the headstock is signed by Les Paul. 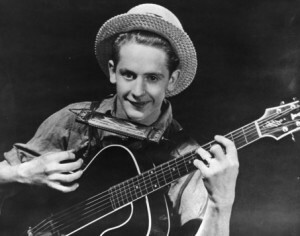 Together with a handwritten note reading, "frets on low side - dip in middle - P.U. good would like jumbo frets."" 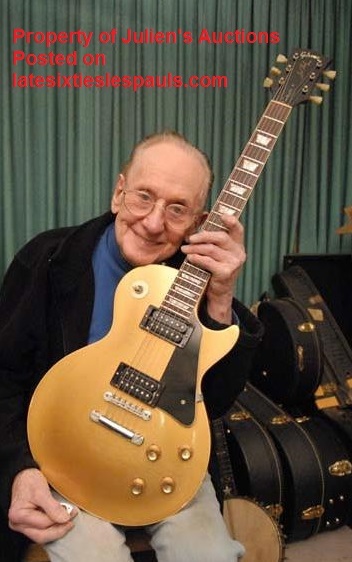 "Gibson Les Paul Deluxe, Gold with 2-Hi-Im Pickups with Lo-Hi circuitry. 2-Input Jacks. Second Input & Selector Switch need to be Installed. Cleaned & Polished." He continues on a piece of tape saying, "Tommy Doyle Fixed Neck '99". Les is referring to the fact that this guitar has a headstock repair behind the nut with mild finish work done. I believe this is how the guitar is mislabeled with the same serial number as his mint 8360xx. A simple mistake. Julien's Auctions seem to have found it's correct serial number of 8368xx when preparing for the auction. I find it interesting that this one sold for less than his mint one; I would have much preferred one he actually used and modified! 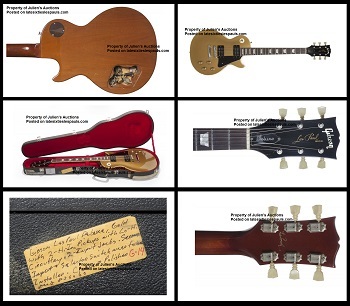 Julien's Auction Description: "Serial number 8368xx - 1969 Gibson Les Paul, gold, with original case. 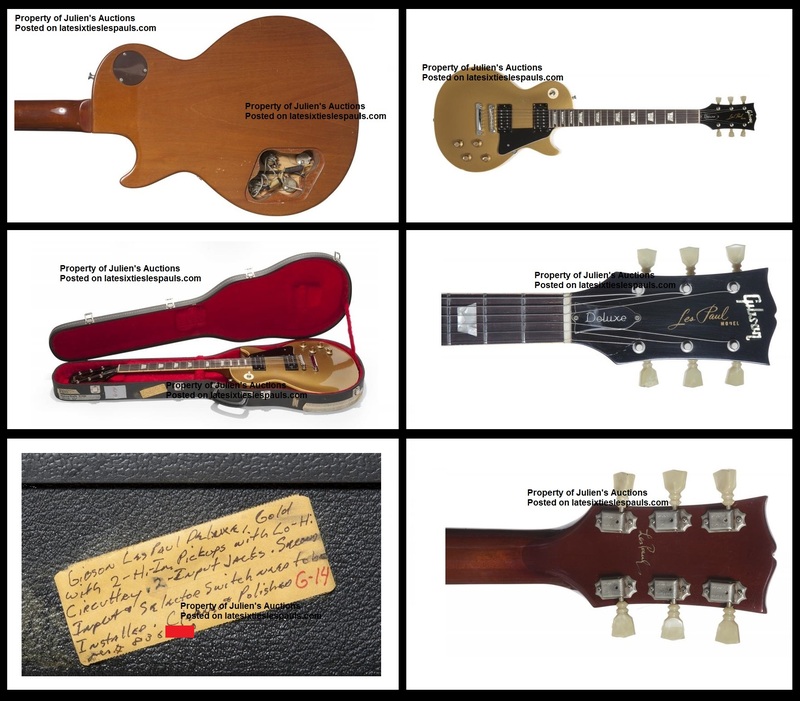 Back of the headstock is signed by Les Paul. Repaired headstock, refinished neck, back plate missing from pots. Routed for Humbucker pickups Gibson T top pickups, no covers with hardshell Gibson case."